Oslon SSL-LEDs by OSRAM Opto Semiconductors stand for high light output. 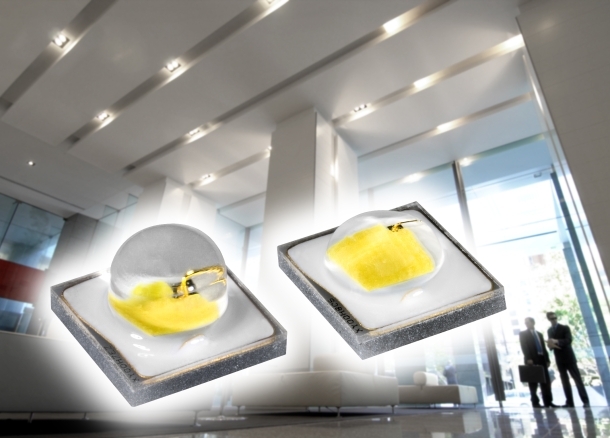 The new generation of high-power-LEDs will be appreciated by users for its improved performance, with an efficiency increase of approximately 25 percent. Additionally, the luminous flux of the LED at elevated temperatures has now been stabilised. In doing so, it is possible to retain a virtually constant luminous efficacy, despite high application temperatures. Thanks to this optimisation, the luminaire design is significantly simplified. With the new generation of Oslon SSL LEDs, OSRAM Opto Semiconductors presents a particularly temperature stable light source. The LED provides a luminous flux of typically 98 lm in warm white (3,000 K), with an operating current of 350 mA at an application temperature of 85°C in the chip. With its typical luminous efficacy of 96 lm/W, referring to the ratio between luminous flux and expended electrical output, it is among the most efficient 1 mm2-Chip-LEDs presently to be found on the market. The combination of higher luminous flux and reduced forward voltage of 3.1 V equals an efficiency increase of approximately 25 percent, when compared with the previous generation. For manufacturers of lighting solutions, this makes luminaire development much easier: a smaller number of LEDs attains the same luminous flux, as well as the same efficiency as before. The latest developments in chip technology, converters, and package are the secret to the performance optimization of the Oslon SSL. The higher temperature stability of its luminous flux, even when operating under "hot" application conditions, significantly simplifies thermal management. "This efficiency enhancement not only implies a reduction of the initial costs incurred by our customers, it also makes the development of luminaire solutions so much easier," says Martin Wittmann, responsible marketing manager at OSRAM Opto Semiconductors. The new OSRAM Oslon SSL LEDs are available in the light color "warm white" (3,000 K), suitable for interior lighting (type EC), for instance in downlights, as well as in "cold white" (5,000 K), for use in exterior lighting (type PC). As with the previous products of the OSRAM Oslon SSL-range, also the new arrivals are available in the small component size of 3 mm x 3 mm and offer two different lenses. Thanks to the reflectivity of the package, the light that is irradiated to the side or to the back is reflected and can be used again. “Thus, this LED generation, which combines the converter and reflective package, ensures the best possible light color homogeneity over angle,” Martin Wittmann adds.